Thanks for your interest in CottonBraidedWire.com. We make reproduction parts for antique and vintage motorcycles. Making parts for many U.S.A. makes and models, from 1901 to 1966. Wiring harnesses and sparkplug wire sets and many other tin and metal parts. We are expanding our product line monthly, so stop by often. 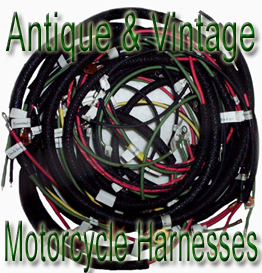 We strive to make the best parts and wiring products for U.S.A.
made antique and vintage motorcycles.